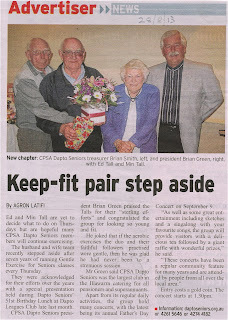 The local Advertiser Newspaper carried a report about a couple of our members. If you want to take part in any of our activities or want to find out more about them have a look at the Club Activities Tab (above). Monday is the club bus trip to Meroogal House in Nowra, we meet at 8.15am. Don't forget that Monday 9th September at 1.30pm our enthusiastic concert group will be presenting their Fathers' Day Concert in the main hall in Heininger House. Everybody is invited, the concert group would love a gold coin donation as you enter the hall. For that you will receive a couple of hours of entertainment, a light afternoon tea and a gigantic raffle with many wonderful prizes. Come along... you will be made very welcome and have a lot of fun. 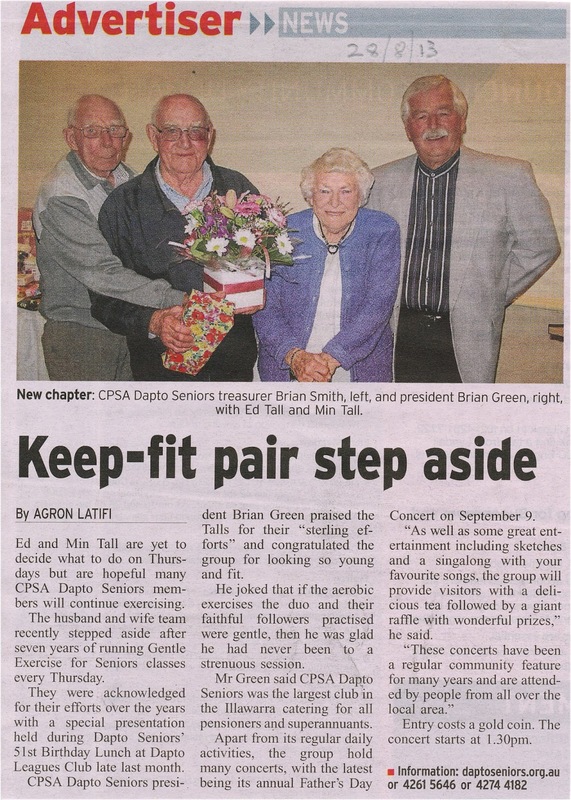 The concert group would be delighted to see a hall full of smiling faces. There is plenty of parking. Tickets for the 19th September Fathers' Day Lunch are still on sale at our next meeting. Still only $15, every member is welcome. Don't forget to write your name on the back of the ticket so you are in the draw for our many raffle prizes.